Last day while i was having a coffee wit my friend at News Cafe in Florence i saw their wine collection and my eyes stopped to this nice label that look like a paint. 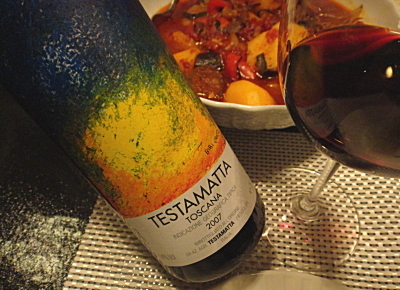 I took out my phone and find out what it was From several search i find out Testamatta 2007 from Fiesole Florence. After reading some reviews online and checking the price i decided to buy and try it with my chef. When i went to the restaurant i invited the Chef and opened the wine to taste. As soon as I put the nose inside the glass and had the first seep, i just stopped for a couple of seconds and said ‘ What is this ‘ It was one of the best red wine that i had in the last years. Testamatta is Sangiovese that letterly explode with his strong character, balanced and a perfect combination between elegant and structured with notes of tobacco and cranberries. elegant in the palate and smooth tannins. Full-bodied but not strong that brings allegria in the mouth. A Sangiovese over the top but still himself.